The All-Girl Competitive Cheerleading team at Michigan State seeks support as we move toward our goal of competing at National Cheer Association (NCA) nationals in Daytona, FL. This is why we are reaching out to you! With your support and generosity, we can once again represent Michigan State at nationals. We are a club sport team at Michigan State that provides college athletes the opportunity to continue their passion for the sport by creating a challenging mental and physical environment. Our team serves as spirit ambassadors for the University and hopes to represent MSU in Daytona this April. Thanks to support from donors like you, we are able to represent MSU around the country. Last season, our team was fortunate enough to travel to Oklahoma City, OK, NCA Nationals in Daytona, FL, and STUNT Nationals in East Lansing, MI. Our team was able to place third at NCA Nationals and second at STUNT Nationals. This was a momentous accomplishment, considering that we compete against top teams from around the country. 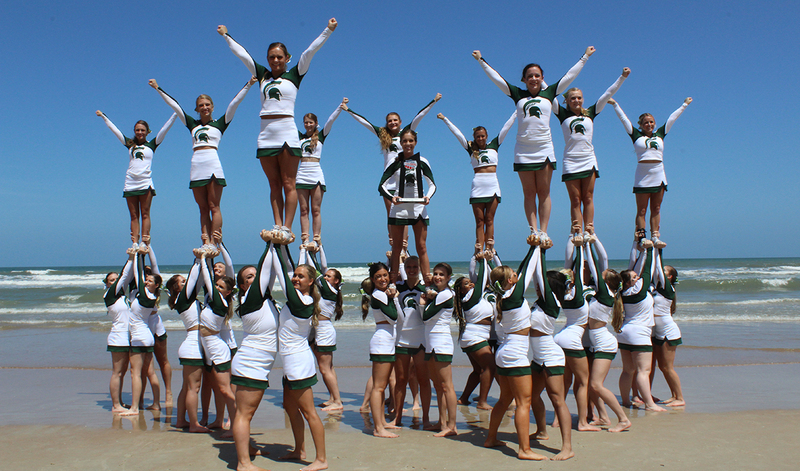 The Michigan State University All-Girl Cheerleading Team is the university’s only competitive cheerleading team. We travel across the country to compete in both NCA and STUNT competitions. STUNT is a new sport to the world of cheerleading in which teams compete head-to-head in a "game-like" manner. NCA is the more traditional form of cheerleading which includes music, stunting, tumbling and a game day portion. Check out our performance in Daytona nationalsfrom two years ago! *Make check payable to Michigan State University and write “Appeal 19OOPCF1CHEER” in the note section.